Figures from 2010, the latest available, show that about half that caribou range was already disturbed. EDMONTON - The Alberta government is holding a huge new sale of energy leases more than 10 times the size of previous offerings on endangered caribou habitat. Bidding is to close next Wednesday on 21,000 hectares in northwestern Alberta that are home to the Redrock-Prairie Creek herd, which both the federal and provincial governments have promised to protect. Figures from 2010, the latest available, show that about half that caribou range was already disturbed. Ottawa's caribou recovery plan, issued last summer, said no more than one-third of a herd's range should be disrupted by industrial activity. It's the latest in a series of sales on caribou habitat, although previous offerings have been smaller than 2,000 hectares. All have come despite repeated plans and promises from the provincial and federal government to do a better job protecting the herds, some of which are considered in imminent danger of disappearing. Seismic lines and roads into forests and wetlands provide wolves with easy access to caribou, which results in higher predation than the caribou can tolerate. That predation has been kept in check on one range by shooting and poisoning wolves — more than 1,000 since 2006. No such program exists for the Redrock-Prairie Creek herd, located near the town of Grand Cache. "There is no discussion of extending the program to that area," said Alberta Environment spokesman Duncan MacDonnell. Just because leases are sold, doesn't mean development will immediately occur, he said. The province has issued a moratorium on sales for one herd's range. It has also promised to release range plans for three or four other herds in the area that would outline protective measures, although one of those plans is more than a year overdue. 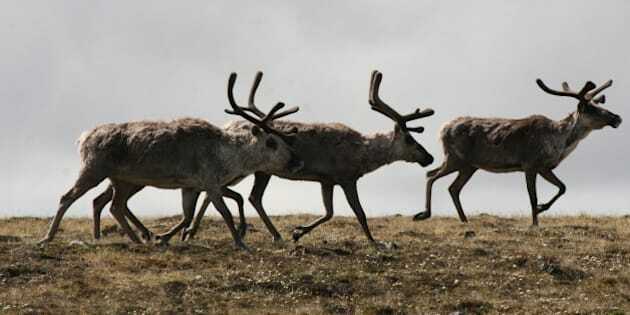 Energy companies operating in caribou habitat are subject to numerous restrictions, including timing of industrial activity to avoid calving and migration as well as rules on pipeline height, site access and reforestation. Caribou biologists have said those mitigation measures are of little help. Mountain caribou herds have lost 60 per cent of their numbers over the last decade, largely due to industrial activity in their habitat. The Redrock Prairie Creek population is thought to have declined by 40 per cent since 2009 to 127 animals. Federal scientists have said all Alberta's mountain caribou herds should be considered endangered, the most serious risk assessment available under Canadian law. The decision to sell off such a large part of the Redrock-Prairie Creek range raises questions about the sincerity of the Alberta government's pledge to be a model for environmental stewardship, said Carolyn Campbell of the Alberta Wilderness Association. "Despite promises to be a good global environmental leader, we're not seeing that in the government's actions," she said Thursday. "This should stop." No one from Alberta's Energy Department was immediately available to comment.